Governor Chet Culver is using his first "condition of the state" message to call on lawmakers to set aside their partisan differences and "get along." Culver, a Democrat, says Iowans expect their state officials to "do their work" and end the 2008 legislative session this spring as "friends." Culver’s advising lawmakers that "civility works." In addition, Culver has outlined a state budget plan that includes a call for a change in business taxes. It’s called combined corporate reporting and it’s a means of barring big companies from moving transactions made in Iowa into another state where taxes on those sales would be lower. "It’s just not fair that big, out-of-state, multi-billion dollar corporations that do tens of millions of dollars of business in Iowa avoid paying Iowa income taxes because of an outdated tax loophole," Culver said. "While it might be convenient for them, it’s just not fair, especially for Iowa-based businesses." Republicans charge it would be a "job killer" as some corporations would quit doing business in Iowa, but Culver’s administration says there’s no data to support that charge. Twenty-one other states have such a law on the books. "Our neighbors in the Midwest like Nebraska, Illinois, Minnesota, Kansas and North Dakota have already done this, and we should, too," Culver said. Culver’s also requesting a prison system expansion that would be the largest Iowa’s ever seen. Culver backs construction of a new maximum security prison in Fort Madison, renovation and expansion of the women’s prison in Mitchellville as well as upgrades and expansion to existing prison facilities all around the state. Culver suggests that the state borrow the money for that prison expansion by issuing 260-million dollars in bonds. 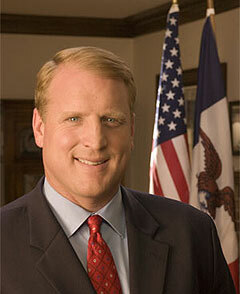 He also proposes 120-million dollars worth of improvements at the Veterans Home in Marshalltown. The governor’s budget follows through on previous promises to raise teacher pay and expand the number of Iowa kids who have health insurance coverage. "I believe our goals this session are simple: protect our priorities, balance the budget and address some unmet needs," Culver said. Culver also challenged legislators to join him on a new health kick. "In an effort to provide leadership on this important issue, I have asked every state employee and today I ask everyone in (the legislature) and all Iowans to join the lieutenant governor and me, to take on the 100-day ‘Lighten Up, Iowa’ challenge," Culver said. "Let’s lose weight and exercise more together." Culver pledged to approve legislation which would let cities adopt anti-smoking ordinances and he reviewed his proposal to increase the bottle deposit in Iowa to 10 cents, with a portion of the extra money diverted to state environmental programs. Republicans charge it would be a "job killer" as some corporations would quit doing business in Iowa, but Brad Anderson, a spokesman for the governor, says there’s no data to support that charge. Anderson says 21 other states have such a law on the books. He also points to a Forbes magazine list of the top ten states in which to do business, as seven of the 10 states already have the business tax system that Culver seeks. Culver’s also requesting a prison system expansion that would be the largest Iowa’s ever seen in one year. Culver backs construction of a new maximum security prison in Fort Madison, renovation and expansion of the women’s prison in Mitchellville as well as upgrades and expansion to existing prison facilities all around the state. Culver suggests that the state borrow the money for that prison expansion by issuing 260-million dollars in bonds. The governor’s budget also follows through on previous promises to raise teacher pay and expand the number of Iowa kids who have health insurance coverage.